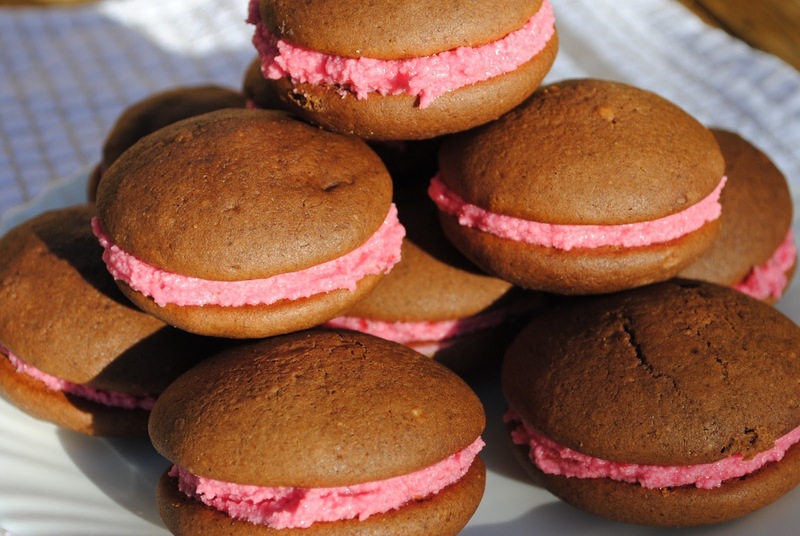 I had no idea what a Whoopie Pie was until I watched an episode of Chelsea New Zealand’s Hottest Home Baker and these were part of a 5 item challenge. Afterwards I was eager to try the recipe, but it called for Cocoa Butter – perhaps a misprint? I wasn’t sure, but after a bit of searching, I came up with the recipe below. They are sooooooo easy to make and the batter is absolutely delicious – I must’ve eaten about a third of it before baking even began. The recipe is taken from another blog: http://www.kingarthurflour.com where they are described as the best parts of a cupcake – the top and the icing. I have to agree, they are truly delicious and didn’t last long once my son and 3 of his friends got hold of them. My husband even enjoyed them and he’s not a fan of cake – give them a try – a nice alternative to a tea time biscuit. Preheat the oven to 180°C. Lightly grease (or line with baking paper) two baking sheets. In a large mixing bowl, beat together the butter, sugar, espresso powder, baking powder, baking soda, salt, and vanilla till smooth. Add the egg, again beating till smooth. Add the cocoa, stirring to combine. Add the flour to the batter alternately with the milk, beating till smooth. Scrape down the sides and bottom of the bowl, and beat again briefly to soften and combine any chunky scrapings. Drop the dough by the 1/4-cupful onto the prepared baking sheets, leaving plenty of room between the cakes; they’ll spread. A muffin scoop works well here. NOTE: I filled a piping bag and used Wilton’s no. 1A tip which squeezed out perfectly round blobs, no messing about with scoops! Bake the cakes for 15 to 16 minutes (I have a hot oven and mine were done after 13 mins so check a few minutes before the full time), till they’re set and firm to the touch. Remove them from the oven, and cool on the pans. While still lukewarm, use a spatula to separate them from the pan or parchment; then allow to cool completely on a rack. I’m not keen on manufactured flavours and colours, and didn’t have any strawberry flavour in the house in any case, but I did have frozen strawberries in the freezer! Slowly cream the butter until it is very soft and turns a very pale yellow, almost white colour. Sieve one cup of icing sugar and add to butter, along with a little milk/cream. Beat until smooth. Continue alternating these two ingredients until you have used all 3 cups of icing sugar. Add the strawberry flavour and colour and blend until smooth and incorporated. Tip: when using frozen strawberries (or any berry really), microwave for a few seconds to defrost and then mash with a fork. The berry pulp and juice can then be added to the icing mixture in place of the flavour and colouring. If you prefer a stronger colour, add a few drops of food colouring. When the whoopie pies have cooled completely, sandwich them together with a thick layer of the icing mixture. This recipe makes about 14 medium sized whoopie pies (28 halves).